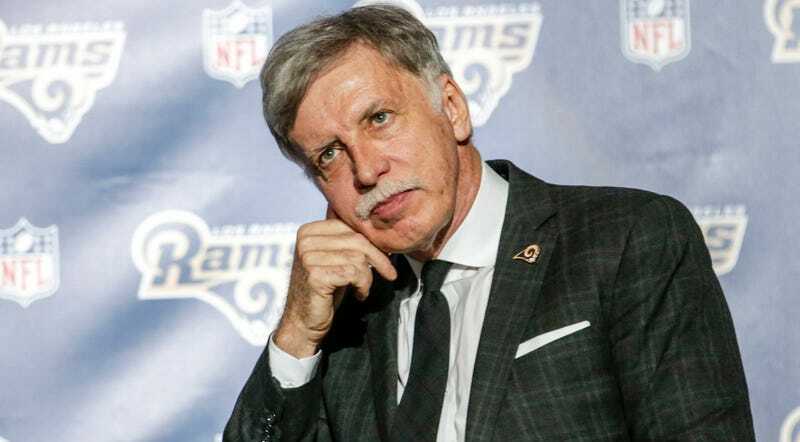 The Los Angeles Rams took to their move to California with immediate verve, and tried to broadcast their identity by telling you exactly where their press conferences were (Manhattan Beach baby!) and selling you insufferably branded gear. But, according to a report yesterday from PFT, one thing the team has a sentimental hold on and just can’t let go is Missouri’s more management friendly labor laws. “We believe that any reference to the state of Missouri is inappropriate since the Rams have relocated to California as evidenced by the fact that they have changed their name on their website to the Los Angeles Rams, are prepared to hold off-season workouts and training camp in California, and will practice and play their home games in California in 2016,” the union says in the memo to all agents. It’s a pretty audacious and tone deaf bit of legal wrangling to pack up and leave Missouri because you wanted more money, then turn around and try to squeeze your players under the laws of the state you just left. For reference, workers in California get their payments within three days, employers spend more than $3 per $100 payroll dollars (the most in the nation), and hurt employees are entitled to a maximum of $1112.83 per week. Missouri employers spend $1.98 per worker per $100 in salary and workers can earn up to $886.92 in weekly benefits. They rank in the 20s among U.S. states, while California is at #1. Since NFL players get hurt all the time, the Rams probably could have saved some money. Unfortunately that would be a gross violation of NFL player’s rights and a pretty skeevy way to take advantage of the state you just flew the coop on. Nice try, wombat hair man.